On June 7, 2018, I gave a presentation about “HR trends and the opportunities for learning organisations”. I tried to cover 18 trends in 45 minutes, and as the beamer lost connection a couple of times, the actual presentation time was less. I realise it was probably a bit too much for some people in the audience to digest, at the end of a long and intensive conference day. For the audience of last week, and for all others who are interested in the subject, I prepared a summary, that can be digested as slow or fast as you want. The most important long-term trend, in my view, is personalisation. It is related to the employee experience. I have also labelled this trend “From Please the boss to Employee Intimacy”. 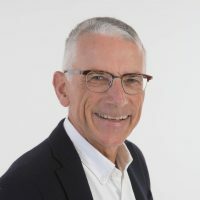 Do organisations really take the effort, to get to know their employees (and other people, who are not necessarily on the payroll). What do people aspire? What are their capabilities, what do they want to learn? Generally, organisations do not take a real effort. In the two pictures below, I try to outline some elements of personalisation, in relation to learning. 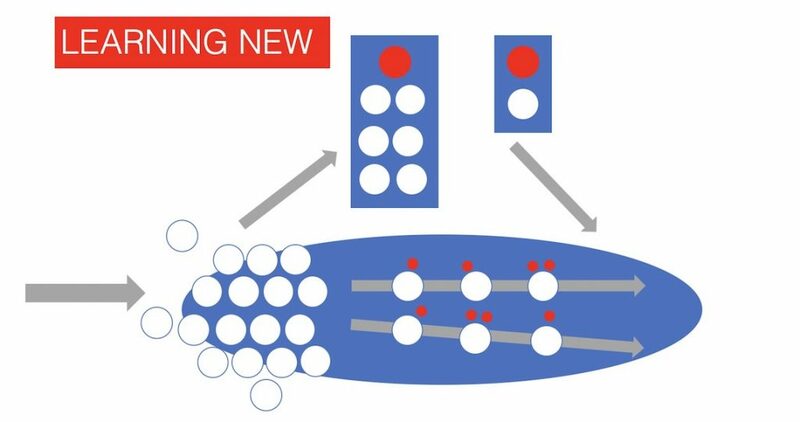 In the “old” situation: groups of people (new employees, high potentials, leaders) are treated as a group, and receive basically the same learning intervention. Often in a classroom, away from the real work. In the new situation, employees (and other people working for an organisation) are treated as individuals. Most learning takes place on-the-job (the lower part of the picture). Tailored to the individual needs, a wide variety of micro-learning solutions is offered. Of course, when people must learn something new that will take a considerable effort, this will happen off-the-job, but preferably not as collective as in the old situation. 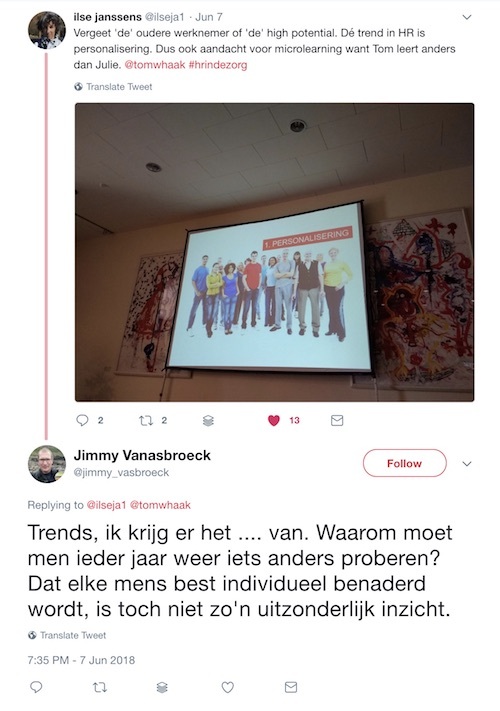 Jimmy Vanasbroeck tweeted, after my presentation (see picture below): “I am fed up with all these trends. Why do we have to try something new every year? What is new about treating people as individuals?”. I totally agree with Jimmy, this is nothing new. The question is: why doesn’t it happen more in organisations? Fortunately, in my view, the movement is in the right direction (but slowly). Based on research by the University of Kent, Headway Recruitment made a nice infographic summarising the skills that are best suited for the (short term) future. As some of these skills are not so easy to develop, it is worthwhile to take them into account when selecting new people. Read: Trends in future jobs. Fior HR, and learning and development, a key question is: who do you consider to be in scope for your activities? Only the people on the payroll, or also all the other people who contribute to the organisation (the flexible workforce, students, alumni etc). When organisations work with self managed teams, there is an opportunity for HR to give shape to the important role of personal coaching (see also 14, performance consulting). Teams are the main building blocks of most organisations. Learning and development is probably the part of HR that gives most attention to teams (Read: From individuals to networks of teams). In some organisations, HR professionals are transforming into agile coaches. 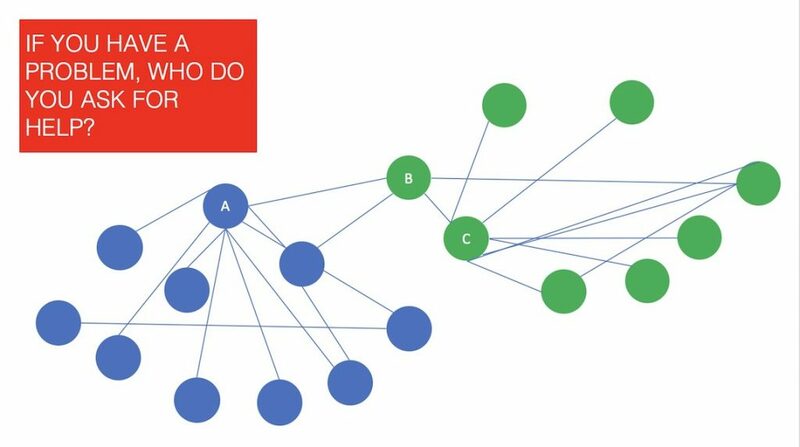 Organisational Network Analysis (ONA) is a technique that can be very helpful in the learning and development domain. For example, to help finding specialists, who can be part of wider learning networks. Some people who are the go-to person in their team for specific problems, can be very valuable in improving the capabilities in other teams as well. The slow shift has been going on for years now. The Tayloristic organisation, where everybody has a clearly defined and assigned job, often does not work so well. Especially when the assignments are not so clearly defined, more flexibility is required. The jobs become more flexible, and employees get the opportunity to craft their own job, to make the best fit with their wishes, needs and their capabilities. Read: The end of static jobs. Learning content is more and more made available in small chunks. On elearningindustry.com I found the following definition: “Microlearning is a way of teaching and delivering content in small, very specific bursts”. Microlearning is also related to the trend from just-incase to just-in-time learning: you learn new skills and knowledge best when you really need it and can apply it immediately. It makes a difference if an employee must search actively for a learning module that he or she needs, or that the module is offered at an appropriate moment in the workflow, based on real time observations of the behaviour the employee. If there is a meeting with company X in your diary, your personal learning aid might ask: “Do you want to learn more about company X?”. If you are stuck in designing a difficult Excel macro, the Excel chatbot asks you: “Can I help you to design the macro?”. If you have a meeting scheduled with an employee with a low performance rating (the computer get this information in the HRIS), you are offered a short module “how to deal with under-performing employees”. The solutions become even better if your individual learning style and the level of your capabilities are considered. The employee experience has many facets. The learning experience is one of them. How do employees experience learning and development? Do they feel an individual approach? Are the learning activities and the learning tools up-to-date and are current technologies used? Many HR practices were designed in the last century, when many things were a lot slower than today. Have you adapted and redesigned your practices? An annual personal development plan is probably not very helpful when it comes to being faster. Football clubs track their players almost 24/7. On the field, during the training, and while they are sleeping. The data is used to give the players feedback they can use to improve their performance. The combination of data gathered by intelligent devices combined with the observations of the trainers, increases the quality of the feedback. Gathering real-time data on the individual performance of employees is still not widely used. There are privacy issues, and if the data is misused by the employer the trust of the employees goes down. Making sure the data is only used for development can help. Using individual trackers in the workplace will increase, and if the organisation does not provide them, employees will bring their own (like the FitBit and the iWatch). Some tools that show a glimpse of the direction learning tech tools can take are Joonko and Rescuetime. 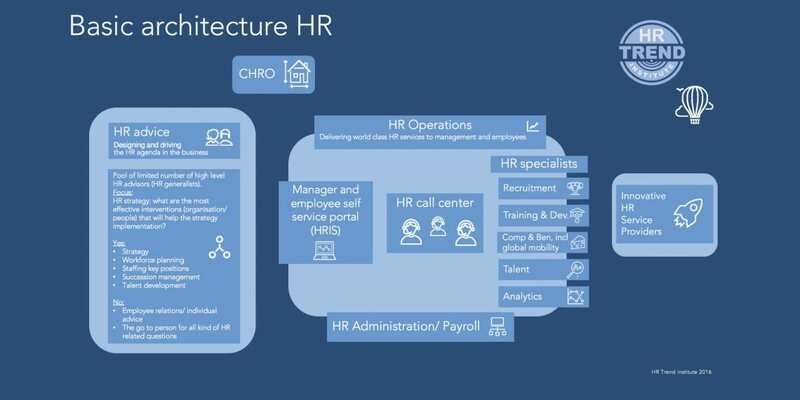 Chatbots are rapidly entering the HR domain, also in learning and development. The chatbot as the interface between employee and learning solutions. “I see you are struggling to complete this article? Can I help?”. Onboarding solution provider Talmundo, for example, is now providing an onboarding chatbot. Read: The invasion of chatbots. Social Learning uses the principal, that people can learn and change their behaviour by observing others. With the current technologies, you can observe many more people than the people who are close to you in the office. Working Out Loud is a concept (or a movement) developed by John Stepper. The basics: you work in a transparent way, share your knowledge, connect to other people and develop new relationships, and learn from your new connections. Watch: this video with John Stepper. Especially for developmental purposes, feedback needs to be very specific. I refer to an earlier article, Improving Performance Consulting, for more details. I think it is too ambitious to expect all team leaders to be able to give high quality feedback. Maybe it is better to rely on people who have really developed this skill. These performance consultants can be very helpful, especially in helping top performers to become better. Wikipedia defines nudging as follows: “Nudge is a concept in behavioural science, political theory and economics which proposes positive reinforcement and indirect suggestions as ways to influence the behaviour and decision making of groups or individuals. Nudging contrasts with other ways to achieve compliance, such as education, legislation or enforcement”. An example of workplace nudging: an organisation wants to improve the collaboration between different departments. They could have designed a workshop: “Cross-functional collaboration”. They choose to redesign the office interior in such a way (more open space, only one coffee corner per floor etc) that the employees from the different departments inevitably had more ‘casual encounters’. Read: “Workplace nudging persuades people to desirable behaviour“. Continuous measurement is also the norm in the learning and development area. Measure, measure, measure. Most organisations are still at the first maturity level of people analytics (reporting). Predictive analytics and prescriptive analytics are the holy grail for many. A nice example of the application of predictive analytics can be found in a very nice 2015 documentary (in Dutch) about the protocols they use in an emergency call centre (“According to Protocol”). The call center operators must follow the protocol, that was developed based on the analysis of many calls and the ways accidents were handled. Some people find the protocol a relief, for others is feels like a strait-jacket. Working and learning can be a lot more fun. 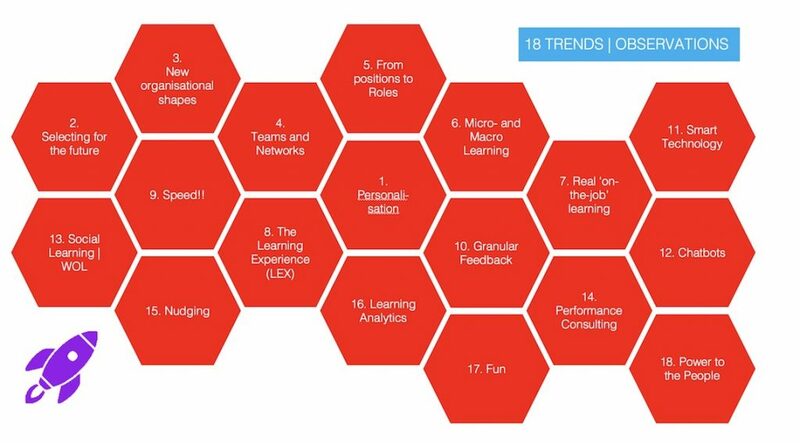 Using gamification in learning and development is becoming more main stream. Read: How gamification will impact corporate learning. Many learning and development initiatives are initiated by the organisation. Often the approach is top-down. What do new employees need to learn? What is the knowledge we expect all the people on this level to have? 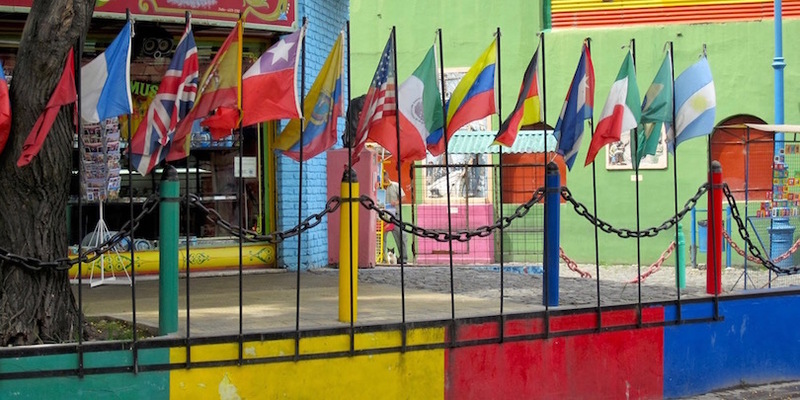 How can we disseminate the global health & safety standards? Often the approach is not only top-down, but also very generic. Learning solutions are designed for groups of people, and not tailored to the individual needs, wishes and learning styles of individual employees. In our article “8 major HR trends for 2018” we noted two trends that are relevant in this context. We called them “Power to the People” and “From Please the Boss to Employee Intimacy“. Employees will start to look for solutions that can help them to become better. Not only for their current assignment, but also for future assignments (maybe at another employer). Employees will want to become more independent of organisations, and they will take their own initiatives. The other day, I came across an interesting example in football. 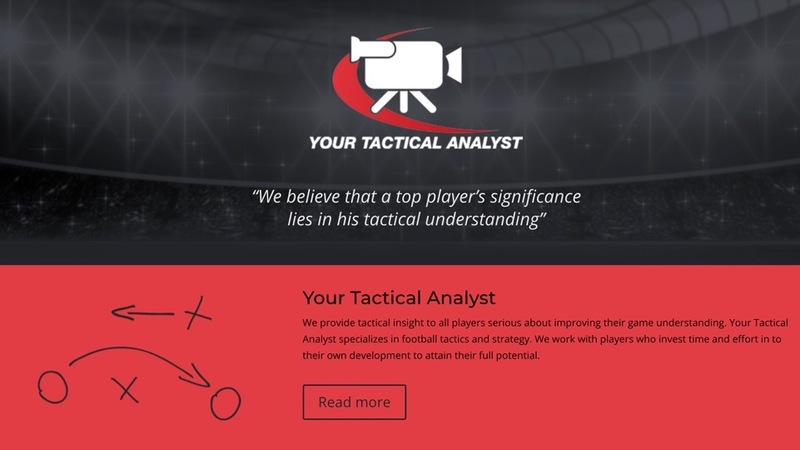 There is a company, Your Tactical Analyst, that helps individual players (who pay them) with a thorough analysis of their matches, and giving tips on how to improve their game. The players do this independent of their club, as they feel the club does not focus primarily (and understandable) on their development. These types of services will also appear more and more in the business environment. Power to the people! (Read, in Dutch: “Voor Stefan de Vrij telt elke honderdste van een seconde. Zo analyseert hij z’n eigen spel“). 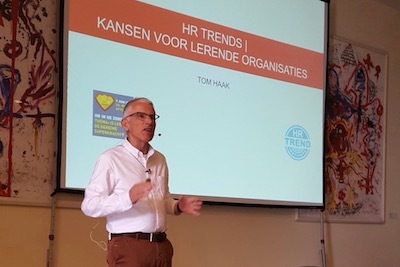 This article is a summary of a presentation Tom Haak gave for the annual conference “HR in de Zorg” that took place in Affligem, Belgium, on June 7, 2018. Nikita Mallya: Are chatbots the future of learning and development for employees? A new paradigm for international transfers?